The Nobel Prize-winning author now gives us a learned, stylish, and immensely persuasive work of literary criticism that promises to change the way we read American literature even as it opens a new chapter in the American dialogue on race. Toni Morrison's brilliant discussions of the "Africanist" presence in the fiction of Poe, Melville, Cather, and Hemingway leads to a dramatic reappraisal of the essential characteristics of our literary tradition. She shows how much the themes of freedom and individualism, manhood and innocence, depended on the existence of a black population that was manifestly unfree--and that came to serve white authors as embodiments of their own fears and desires. 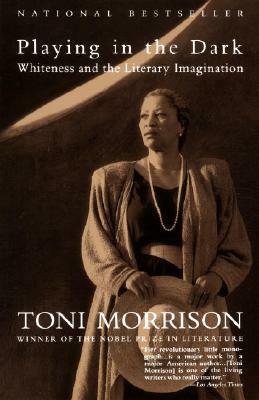 Written with the artistic vision that has earned Toni Morrison a pre-eminent place in modern letters, Playing in the Dark will be avidly read by Morrison admirers as well as by students, critics, and scholars of American literature. "By going for the American literary jugular...she places her arguments...at the very heart of contemporary public conversation about what it is to be authentically and originally American. [She] boldly...reimagines and remaps the possibility of America." "Toni Morrison is the closest thing the country has to a national writer." Toni Morrison was born in Lorain, Ohio. She is Robert E. Goheen Professor, Council of the Humanities, Emeritus at Princeton University. She is the author of eleven novels: The Bluest Eye; Sula; Song of Solomon, which won the 1978 National Book Critics Award for fiction; Tar Baby; Beloved, which won the 1988 Pulitzer Prize for fiction; Jazz; Paradise; Love; A Mercy; Home; and God Help the Child. In 1993 she was awarded the Nobel Prize in Literature.